One of the most popular and heavily visited blog posts I've published is the summary of what social media I read, visit and engage on a daily basis. Those who know me are quite aware that I incorporate social networking in my professional and personal life, and the most common question I'm asked is, "How do you possibly find the time?" Well, simply put, I make the time. I've always felt that weaving together disparate points of information, connecting dots that others don't see, has given me a strategic advantage in my professional life because occasionally I see trends and opportunities before others. I also find value in connecting people when such a connection benefits both parties. And so I read a lot, from many sources. I'm not as consistent as I once was, but I try to spend a little time every day, usually in small doses throughout the day, staying on top of news and developments in my field, updating and sharing some of these tidbits with my networks, and skimming what others in my network have shared. When viewed in the aggregate, it can be a daunting and exhausting effort to stay on top of it -- it's not uncommon, for example, to open my Google Reader on a weekend after a busy week and find over 1,000 unread items. But I learned a lesson long ago that has helped me immensely. I have always been reluctant to start a book or magazine unless I'm prepared to finish all of it, which means I need both the time and the inclination to dive in fully committed. But I eventually learned that this is a dumb rule. So now I happily pick up a magazine and read the one or two or ten articles that interest me rather than read it cover to cover. If I'm three chapters into a book and I simply can't muster the energy or interest to continue, it goes on the shelf. I no longer feel any guilt putting something down and moving on. This has freed me to skim a large volume of sources, selecting those which interest me for further investigation, and literally scrolling past the rest. But an unexpected downside of incorporating a high volume of reading materials into my daily life is that I'm more desensitized to what others may find unusual or interesting because when I've seen twenty references to some tidbit in fifteen different sources over the course of two weeks, it may appear commonplace to me when in fact it's still on the fringe and weeks (or months or years!) away from common knowledge. For example, I vividly recall conducting a Legal Project Management workshop for a group of law firm partners a couple years ago, and not only were they unaware of this growing trend, they didn't even know what the terms meant. 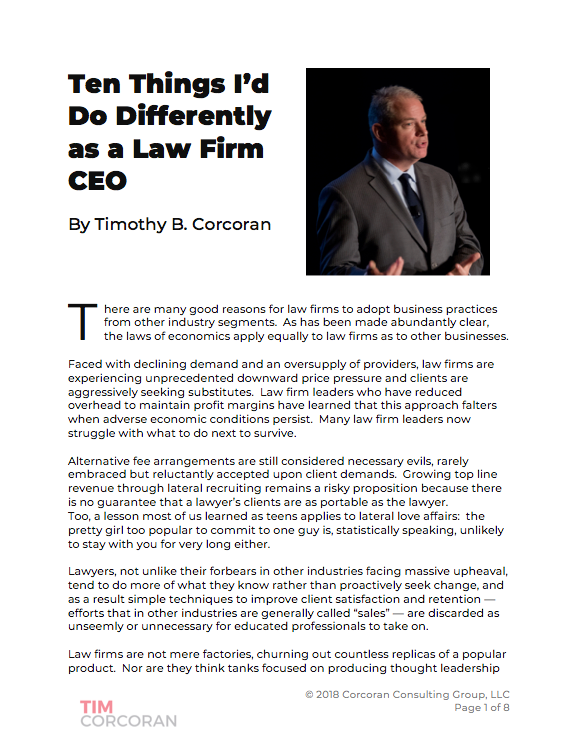 I had forgotten that many lawyers look to precedent to learn, rather than look outside their own experience. Nevertheless, I'd rather read too much than too little. But choices must be made. And so I divide my time across a variety of social networks, reading multiple news sources and blogs, never knowing which might be valuable to me today. Following is a list of the social networks and reading sources I visit daily, or as close as I can get. LinkedIn - I maintain a robust profile here, having achieved 100% on the completeness meter, for whatever that's worth. I tend to research my business connections, such as clients, prospective clients or people who send me resumes. The fact of the matter is everyone will research you and me sooner or later, so I feel we might as well put our credentials out there for review. As for contacts, I now have over 700 connections, of which I have instant recall of probably no more than 70%. I tend to invite attendees at my workshops and speeches to connect with me, which means my network is full of people I don't really know. But LinkedIn provides a handy notes tool which allows me to capture a few thoughts about each contact. Lastly, I will readily offer my network to those interested in finding a job or making a connection, as in "Review my connections and if there's someone you'd like to meet let me know." Few do, suggesting that networking is still a scary proposition whether online or virtual. Facebook - I spend a few moments on here each day, typically posting some inane comment about what I'm doing, skimming what my friends and family are doing, and occasionally offering comments. I never ever play Facebook games. I can't imagine why anyone would care that last Saturday I played two hours of basketball at the gym, folded four loads of laundry and watched a soccer game on TV. But it amuses me endlessly that others find this interesting and so I continue to share. Facebook has turned into a proxy for class and family reunions and annual birthday phone calls, because now I know what my friends and family are up to, even the distant connections I haven't seen in twenty years, so we don't need to catch up. Being more aware isn't the same as being closer, however. Twitter - I have over 800 followers on Twitter, and I'm listed as a "must read" on several lists of legal industry pundits, but I don't actively attend to this network like I used to. I don't believe in the "If you follow me I'll follow you" trend, so I follow only 350 or so, and of these I really only keep track of a few dozen. I like Twitter, and it's a very handy search tool as well as an invaluable tool when attending (or not attending) a conference, but it takes time to navigate through the noise and at the moment it's not capturing my attention as in the past. Legal OnRamp - I'm a big fan of this network and I've spent time with its founder, Paul Lippe. I had the good fortune of being part of the Counsel Connect team, which was a social network for lawyers in the early '90s, well before its time, so I'm a fan of the format and LOR improves upon the model in many ways. This network is fantastic with robust content, good debates and a number of compelling private offerings for member firms. I don't participate so much lately as lurk, but I do enjoy the spirited discussions. Martindale Connected - I like this network too, though it was late to the party and therefore it hasn't really ever entered my daily regimen. I've participated in a few discussions, and I was invited to offer feedback on the last redesign, but -- and I could be totally wrong here -- it seems to skew more toward the small firm audience, whereas I spend most of my time with big firms. Martindale-Hubbell has always offered excellent networking tools, and its shift from directory to social network has been somewhat lengthy and painful, but I have every reason to believe this network will become ever more robust and engaging over time. LMA Connect - This is the official online community of the Legal Marketing Association. Several years ago this particular configuration replaced an easy-to-use email listserve with a somewhat clunkier online interface, which seemed to inhibit usage. I believe at the time the organization also chose not to automatically enroll all members in the online community, preferring to allow members to self-select which forums to join. The net effect is that traffic is much lower than it once was, but it really is a must-read forum for all topics related to legal marketing and business development. Lawmarketing Listserve - This is one facet of the robust online community created by legal marketer turned entrepreneur Larry Bodine. I've been a member of this listserve since 1996 and with few exceptions I've skimmed every posted comment by every legal marketer on every topic for the last fourteen years. I can think of few better ways to stay on top of the pulse of legal marketing than to listen to legal marketers. Google Reader - I use this as my RSS reader, and it works equally well on my PC, my Blackberry and my Android PDA. I love the simplicity, which allows me to quickly skim hundreds of news articles or blog posts in a very short period of time, marking some for future reading, sharing or saving. I've added and deleted quite a few sources from this Management list. There should be plenty of rich sources that fall between the Harvard Business Review and some anonymous rant, but I have difficulty finding good ones that help me grow as a manager and a leader. All suggestions welcome. Humor - There are about a dozen feeds which provide an endless stream of laughs. However, humor is a subjective thing and some may not be appreciated by my readers. Suffice it to say that an RSS reader can provide plenty of amusement in addition to education. If I were more organized, I'd publish a list of what I've stopped reading, and why, because the list does change over time. But alas, interested readers will have to conduct this comparison on their own. You can read my previous social media updates here (2009) and here (2008).